One of the optical properties of many metallic surfaces is changing it’s color slightly as the surface viewing angle changes. This effect can be simply created using a Fresnel node and a color-ramp texture. 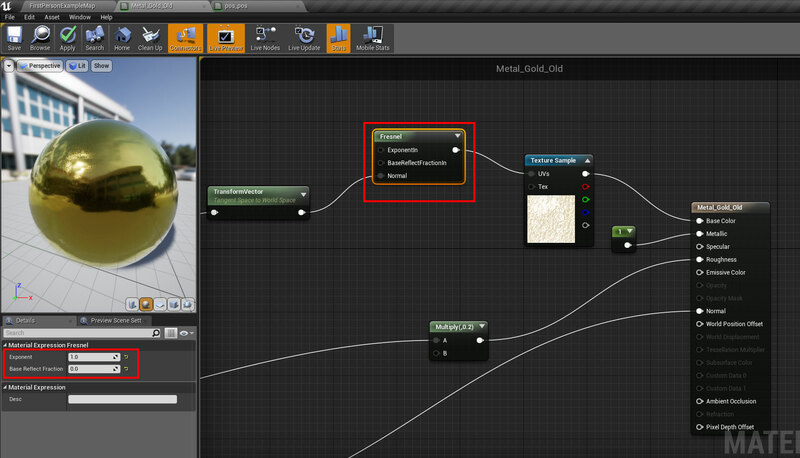 Create a metallic material (metallic value of 1.0). Use an image editing software to create a linear color ramp texture (gradient) of the color change per viewing angle from left to right. like this example for a golden metal, and import it to your project. Add the ramp texture to the material Blueprint, and connect it to the material Base Color Input. Create a Fresnel node and set its Exponent value to 1.0 and its Base Reflect Fraction to a value of 0.0 so it will provide a linear angle blend value. Connect the Fresnel node’s output to the UVs input of the ramp texture node. * the reason the Fresnel node can be providing both the X and Y texture coordinates is that the texture’s Y dimension provides the same color for all values anyway. 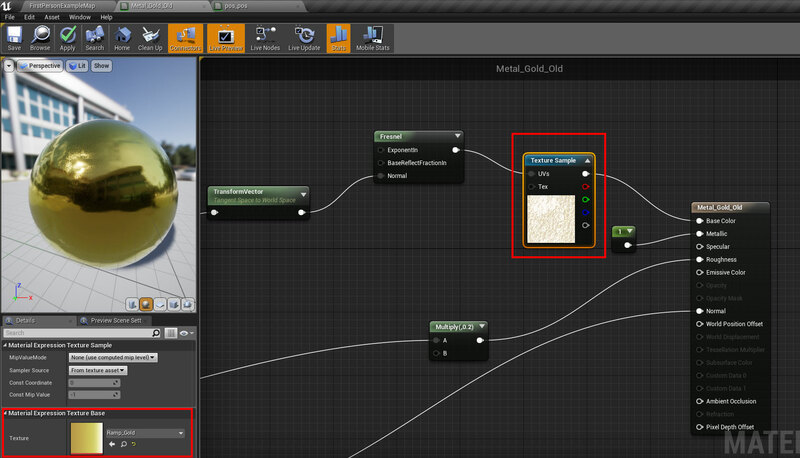 When the Metallic property of an Unreal Engine material is set to 1.0, the material automatically simulates the metal’s color fading to white at parallel surface viewing angle (the sides) like it should. So using a Color Ramp Texture like in this example creates an amplified effect. * Simply put: You don’t have to have the Color Ramp fade to white on the right side of the texture..